Physical interactions of bacteria with host cells are often a principal aspect of bacterial pathogenesis. 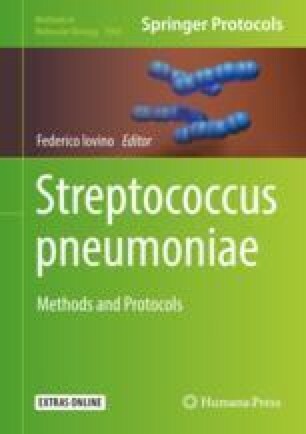 In the case of Streptococcus pneumoniae (Spn), which does not produce a secreted toxin, adhesion to and/or invasion of host cells is necessary for colonization of the nasopharynx and subsequently to cause opportunistic disease in its human host. Knowledge of how pneumococci interact with host cells thereby helps to explain its biology and may identify potential targets for intervention. One of the simplest, yet powerful, assays that can be leveraged to dissect the molecular basis of this vital host–pathogen interaction is the in vitro adhesion and invasion assay. Among many key results, this assay has been used to discover the bacterial and host determinants involved in bacterial attachment, identify host signaling networks required for uptake of the bacteria into an endosome, and the characterization of the intracellular trafficking machinery that is subverted by Spn during development of bacteremia and meningitis. These assays have also been used to characterize the epithelial, endothelial, and/or immune cell response to these bacteria, and to learn how pneumococci disperse from an established biofilm to a planktonic phenotype to colonize another niche and/or transmit. Herein, we will review this protocol, highlighting how simple changes in the bacterial strain or host cell line can elucidate the underlying molecular mechanisms for Spn virulence.